Valentine’s Day has been getting a bad rap for the past few years because it’s been deemed a “Hallmark Holiday” that’s lost its meaning. “Love Day” can cause a lot of angst for kids when it’s celebrated at schools where they may feel left out if they aren’t given a Valentine card or worse feel pressure to do hand them out to kids they don’t want to. Even as adults you may be single or in a new relationship that gets undo pressure because of this sentimental day. Whether you celebrate Valentine’s Day or not, it’s hard to ignore the flowers and hearts and chocolates that surround us at every corner, so embrace it by making something for yourself or for someone that you think would love a handmade card or bracelet or a funny little robot. 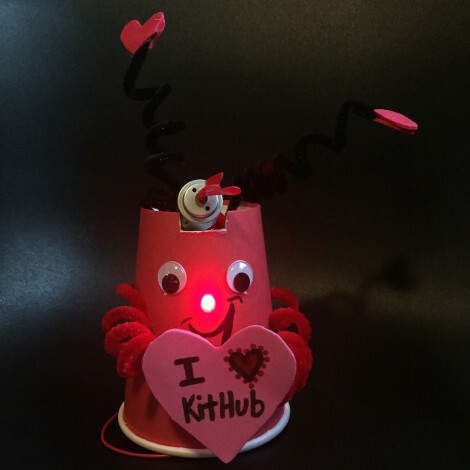 Here are 11 electronics projects that we designed for KitHub or projects that we think would be fun to make for Valentine’s Day. We hope that you enjoyed reading about these projects and are inspired to make one or more of them! We’re always on the lookout for new projects so please comment below and let us know what projects you have enjoyed making for your loved ones. 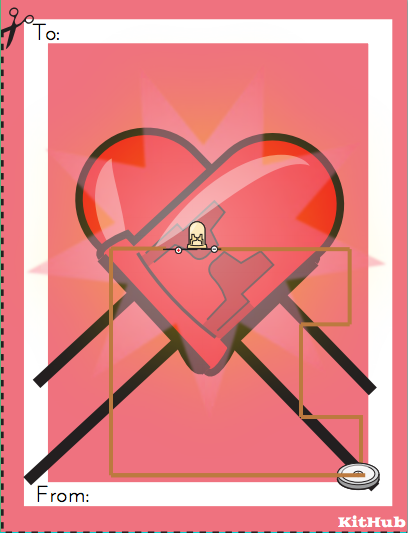 We work with a talented designer named Ruby and she designed these Valentine’s Day cards just for KitHub. Use them as is or add some conductive copper tape (a conductive pen will work too), an LED and a coin cell battery. Your friends’ faces will light-up just like the cards you give them. Download designs here and here. If you don’t have the parts, checkout the Classroom STEAM Paper Circuit Kit that comes in different quantities. A rose by any other name would smell as…duct tape? OK, so these beauties don’t have a pleasant smell, but they will never wilt and they light up! The duct tape maker crowd makes the most incredible accessories and bags and clothing. Definitely give it a try. A robot with heart! We are now in a world where people are dating video game characters, so we might as well get used to it! 😀 Here are the instructions. If you don’t have stickers LEDs, you can use regular LEDs and blinking LEDs. 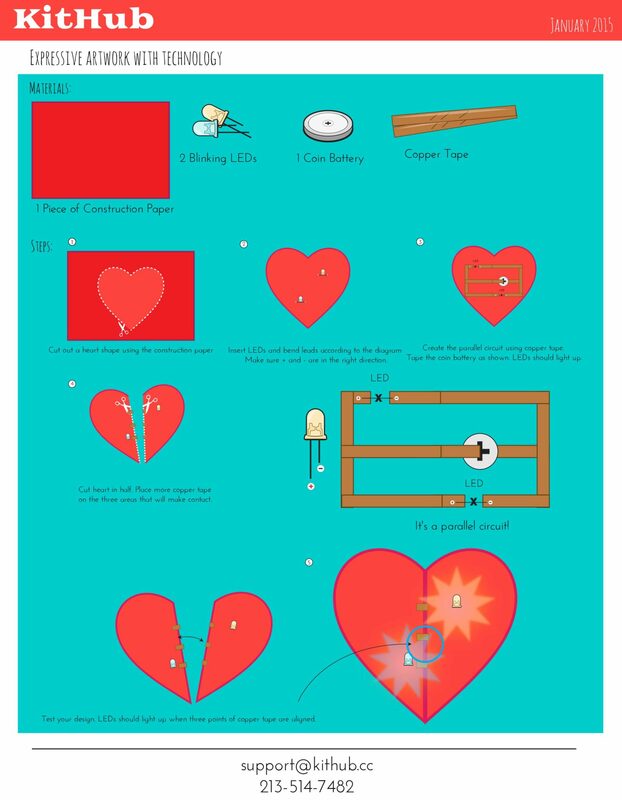 This Instructable by mathiemom states that “by making the Operation Valentine project, students will apply their knowledge of simple electric circuits to create a game.” A delicious game if you ask me! This may be one of the more simple projects on this list, but it’s also one of the prettiest and you can make a bunch of these really quickly for friends and family. Here’s the KitHub Instructable with the instructions. 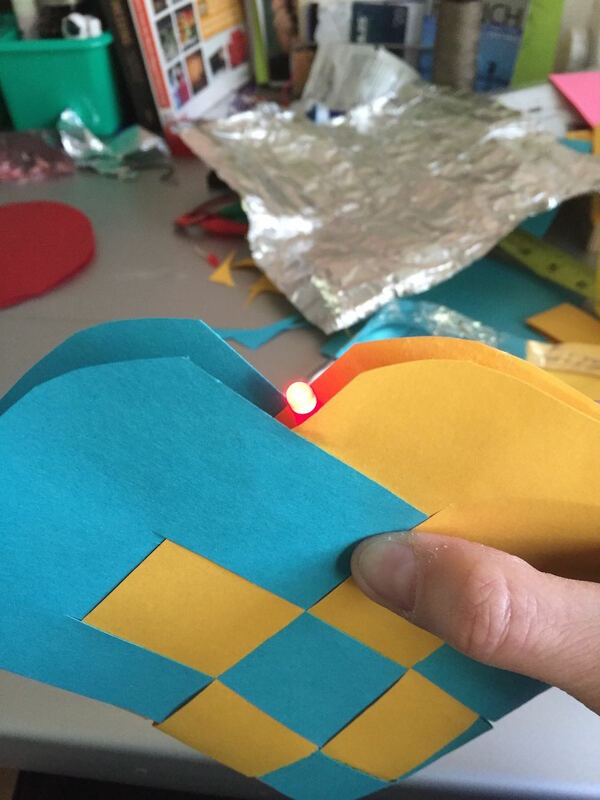 If you’d like to make this kit in your classroom, checkout the Classroom STEAM – Paper Circuit Kit. Lynne Bruning is the one to follow if you want to learn about e-textiles. She taught me the basics at Maker Faire and then at the LA Makerspace. This light-up Valentine pillow is gorgeous. 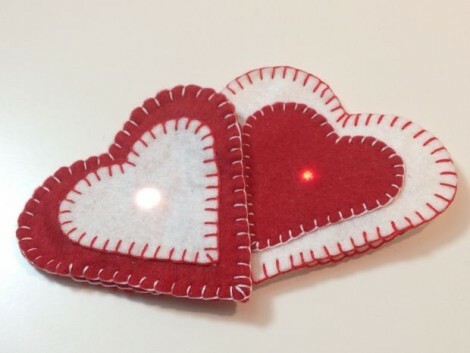 “Look beyond the embroidery and you’ll find a basic LED circuit with some hidden gems on how to sew with conductive thread, mark traces, and hide the circuitry. In the end the Heart Pillow is a lot like Valentine’s Day… look deep and you’ll see that love is in the details.” Awww, I just want to hold this fluffy pillow all day. The instructions are here. I have more motorized bots on my shelf than I can count – everything from SantaBot to BB-8-Bot and even a Darth Vader Bot. I love this project because it’s a really wonderful introduction to circuits paired with art. No single Bot is the same and I like that because the creative process is equally as important as the engineering process. Checkout the Motorized Bot Kit that comes with all of the art supplies or a Classroom STEAM Motorized Bot Kit. No one wants a broken heart on Valentine’s Day! Learn how to make a parallel circuit and your heart will be good as new. For this project you will need card stock, LEDs, a coin battery and copper tape. Here’s instructions for the project. If you’d like to make this kit in your classroom and need the parts, checkout the Classroom STEAM – Paper Circuit Kit. We need to stop with all this heart breaking! This bracelet helps beginners learn how circuits work and operate. This soft-circuit bracelet only is light up when you are wearing it due to the fastened snap. 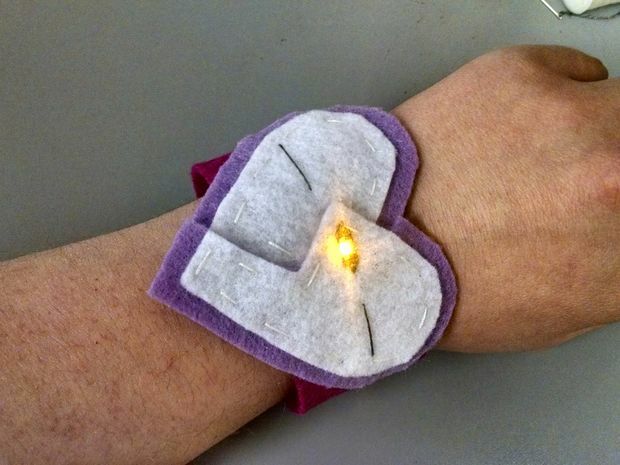 A great way to learn how to sew electronics onto material! Checkout the Instructable. I was digging through my big blue bin of treasures from my school years and I came across a heart pocket that I made. I couldn’t remember how I made it twenty-something years ago so I looked online for instructions and found this fantastic video by Darleen that took me through the steps. 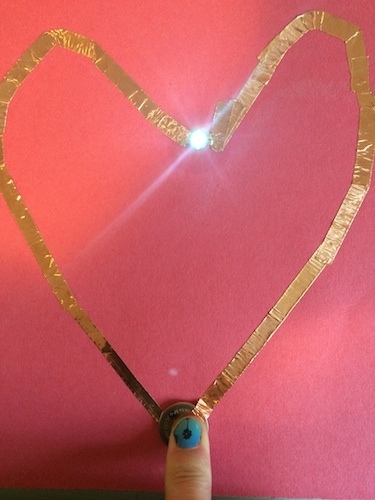 I helped my son make his own Heart Pocket and we added some aluminum foil, LED and a coin battery so that when you close the top of the pocket like a switch, it closes the circuit and the LED lights up. Two hearts blinking as one. 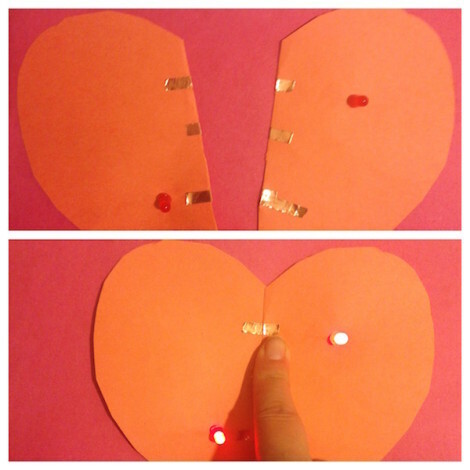 Each of these hearts has a magnetic switch and magnet, and when you put them together the circuits close and the LEDs light-up. Instructions are here.